Mars is the fourth planet from the Sun in the Solar System. The planet is named after Mars, the Roman god of war. It is also referred to as the "Red Planet" because of its reddish appearance. Mars is a terrestrial planet with a thin atmosphere, having surface features reminiscent both of the impact craters of the Moon and the volcanoes, valleys, deserts and polar ice caps of Earth. 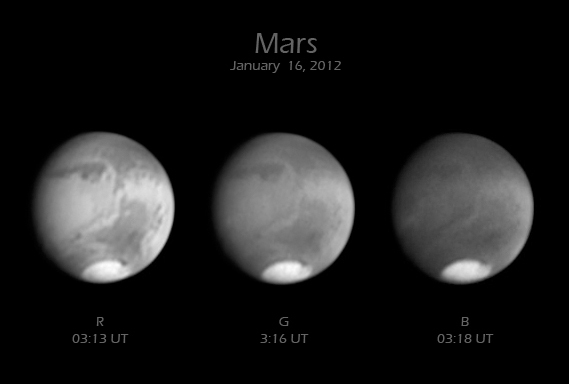 Mars under decent seeing conditions, but even then I could only use about 10% of the recorded frames. I imaged the same side of Mars, so I could make a small comparison between the two recordings. Apart from many subtle changes in the cloud layout, I believe there is also a bit of dust movement near the polar cap. And a small animation in green light. Seeing was decent for only a short amount of time, but still there are plenty of things to see here! Olympus mons is the slightly dark spot surrounded by blue clouds at the right of the center. At the left of the center you can find Ascraeus Mons. If you want to find out what is what on Mars, check out www.calsky.org, under planets, Mars, Apparent view. Enter a date and time, and simply hover over the features on Mars to find out what it is you are pointing at. Slightly better seeing conditions this time. Decent seeing, but it was very cold and windy. My first decent image of Mars this season! Processed using AutoStakkert!2, WinJupos and Photoshop. Resized to 200%. Seeing was pretty good. The animation consists of 17 sets of RGB data, manually aligned and processed in Photoshop. The images were shot between 21:21 and 23:16 UTC, March 9 2010. Shot with the modified DMK21 camera with icx618ala ccd, at 1/54s for every channel.